Teaching With Love and Laughter: 12 on the 12th! I'm linking up with Doodle Bugs Teaching and posting 12 random pictures from today. 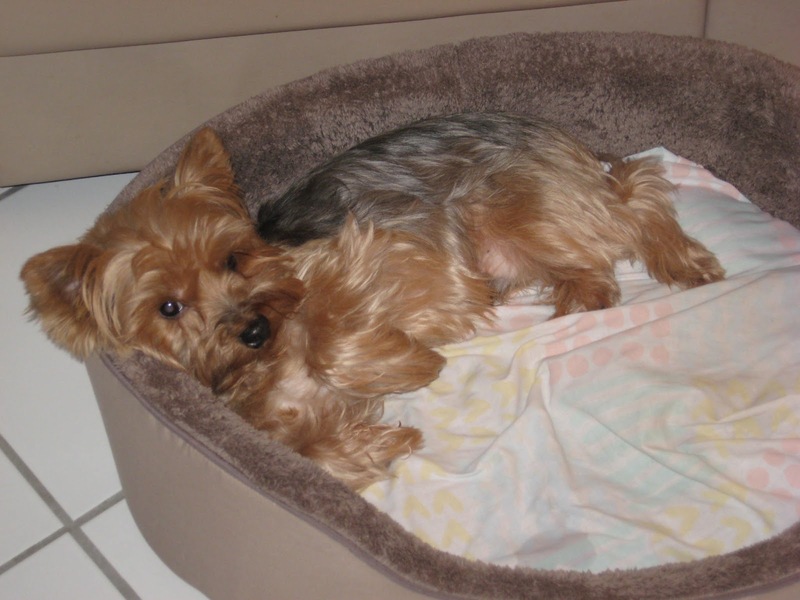 Actually, I am going to take this opportunity to post some pictures of my two adorable yorkies! I hope you find them as cute as I do! 1. What do you mean it's time to get up? 2. Nope, I just can't do it! 3. Maybe if you tickle my belly, I'll get up! 4. I'm just going to stand here and look cute as you get ready for work! 5. Now, I think I'll play with my toy! 6. On second thought, I'm just going to hide from my crazy mommy with the camera! 7. Now it's time to try and wake Buddy! I try to coax him with the massager. 8. This is harder than it looks! 9. All right! I'll perk up for one picture only! 10. And then it's back to bed! Just think, all of this happened before 7:30 am! Time to go to work! 11. Once I got to school, I noticed that my lima beans had grown a lot last night. I usually just grow mold, so this really made me happy. 12. Finally, back home and ready to snap one more picture of Buddy doing what he does best! I know this was a really sneaky way to show off my two little yorkie terrorists, but, a proud mommy's got to do what a proud mommy's got to do! I hope you all link up, too! Thanks for looking! Your babies are tooo cute!! haha I just love dogs! Thanks, Becky! Me, too! Couldn't live without them! So cute! I can see why you loved my cutesie little card now! It goes just perfect with your cutesie little puppies! Thanks for all the warm wishes lately...you've really boosted my spirits! I sent you an email last night...hoping you got it! Talk to you later. Say hi to those little puppies for me! Thanks, Jillian! Yes, I am a total dog lover! I hope you are feeling better. I just replied to your email with a resounding YES!!! Talk to you soon! I use my running blog as an excuse to show off my cute dog -- ha ha -- so I totally get it. And hey! Mine is Max, too! Thanks so much, Barbara! I'm sure your Max is adorable! How cute! I laughed out loud when you called them terrorist. We call our youngest The Terrorist too and I always feel awful about it. I'm sorry I missed out on 12 on the 12th now! Thanks, Christi! Yes, I feel guilty saying it, too, but, it's just so darn true! LOL! I'm LOVING your innovation posts. Thanks so much and keep up the good work. Thanks, Tammy! I am a writing specialist, so we do a LOT of writing. I'm glad you found me. I'm your newest follower! Thanks so much! I always say it's a good thing they're cute because their nicknames are double trouble! LOL! What an adorable puppy!!! I love your blog here - and thanks for doing such a fabulous job on the guest post!!! Your Yorkie pics are so adorable!!! Thanks for sharing. I don't blame you one bit for using this to show off your adorables dogs! Oh.my.goodness... sooooo cute! If I could have a dog I would want a Yorkie!! I am just in love with them. Sooo Cute!! To me, yorkies are just right! Thanks, Corinna! Thank you so much for posting your 12 pictures. Kacey, thanks for giving me a good opportunity to show off my two little devil dogs!